Pizza + Burgers? Yes, please and thank you. Now, you never have to choose again when deciding between these two family favorites. Plus, made with ground turkey, a homemade pizza sauce and mini whole grain buns, you can get all the flavor without the guilt. This recipe for Pizza Burger Sliders is my little chef’s FAVORITE recipe to make of all time because it’s a combination of the two things he loves… Pizza & Burgers. Besides, what kid wouldn’t love to learn how to make their own burger? This is definitely a Big Kid recipe! First, we began with the pizza sauce. We made a homemade sauce using fresh tomatoes. To start, simple rough cut the tomatoes in to chunks then place in food processor to create a chunky sauce. Next, add tomato sauce, tomato paste and seasonings to a sauce pan and let simmer on medium heat. When cooking over a stove, try adding all the ingredients before turning on the heat to minimize heat exposure. Cook until thickened for about 5 minutes, stirring frequently then set aside. Next, combine the ground turkey, steak seasoning, Worcestershire sauce, and Italian herb seasoning in a large bowl. When making turkey burgers, I like using the same flavors and spices as I would for a beef burger. The best part for my little chef was using his hands to mix all the ingredients together. There’s nothing like a little messy fun to get kids cooking. My little chef also had a ball taking the meat mixture and shaping it into small balls. For this recipe, we used an indoor electric grill to make it an easier experience. I waited to turn on the heat until after he added the patties to the grill to minimize risk and heat exposure. While the burgers are on the grill, divide each slice of the mozzarella cheese into 4 smaller slices. Transfer the burgers on the bottom part of the mini whole wheat bun. Be careful if you allow you little chef to remove the burgers from the grill… it will be very hot! Spoon the pizza sauce on top of the burger then add the small slice of cheese. Considering we used an indoor grill, I placed each pizza burger in the broiler for about 5 minutes to allow the cheese to melt into the sauce. 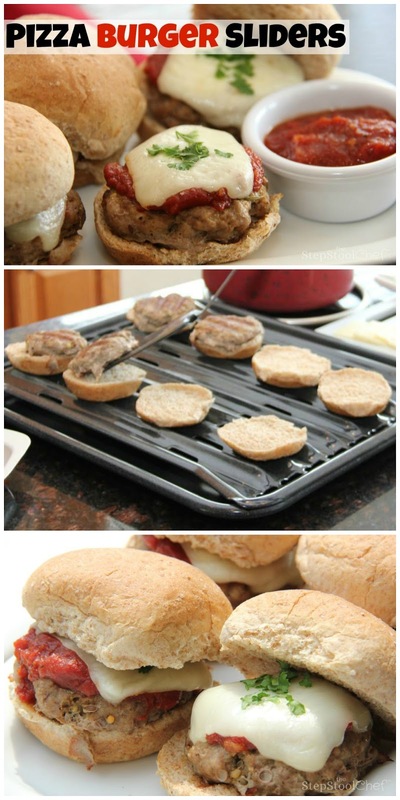 Seriously… these Pizza Burger Sliders came out was AH-MA-ZING! Like nomnomnom…. Everyone loved them. These little bites were made in minutes but devoured in seconds! Want to make Pizza Burger Sliders from home? Make it easily with these recommended products! Pizza burgers sound delish!! I love using ground turkey, too, it’s a great healthy alternative! It was very delish… plus with using the whole wheat buns and fresh tomatoes there was less guilt and more yumminess! Please let me know if you try it!